The Clockwork Owl brings together two extraordinary creatures. 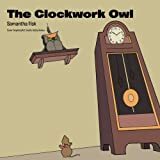 Set in an old house, there lives a small mouse whose days get more exciting when he discovers a clockwork owl. But can a mouse and a clockwork owl become good friends?